Dave Yates’ Touring Bike. You may get by with spending very little of your hard earned cash on the bits of rather exotic metal alloy that you put under your posterior. We have met good people who did just that. $200 on second hand rental bikes with a basket dangling from the handlebars, and a West Coast USA trip that then curved around to include a ride through Death Valley. 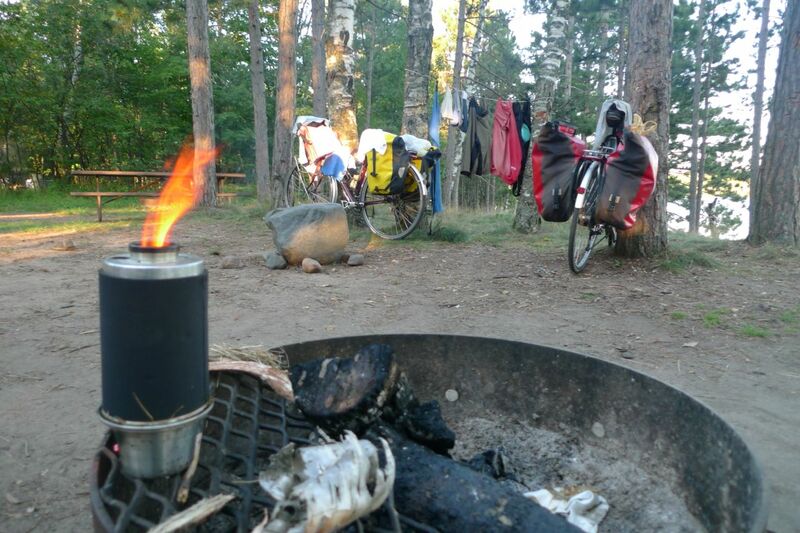 We met people that spent nothing at all on any bit of their bike, preferring a rather feral approach to touring. Bike, bits and maintenance were scavenged by a dive in the next promising looking dumpster. My Dave Yates custom built touring bike. Hats off to both approaches, but I want some comfort and a life without too much worry. I may be getting old. Both our bikes are Dave Yates custom touring bikes, in a sort of English style. Drop bars rather than the ‘stupid butterfly bars’ of a mainland ( Germany! ) touring bike, they are what you would have got in 1972 if you had put ‘racer bicycle’ on your Christmas list. If you already own a drop handle bar bike, then add 1cm or half an inch to the bar hight and you have got it about right. Leave some stem height on the forks so that you can go up a bit if you get back issues. Shimano XT. You may get away with a poor choice of frame. Make a bad choice of the things that you hang off it and you may end up walking. 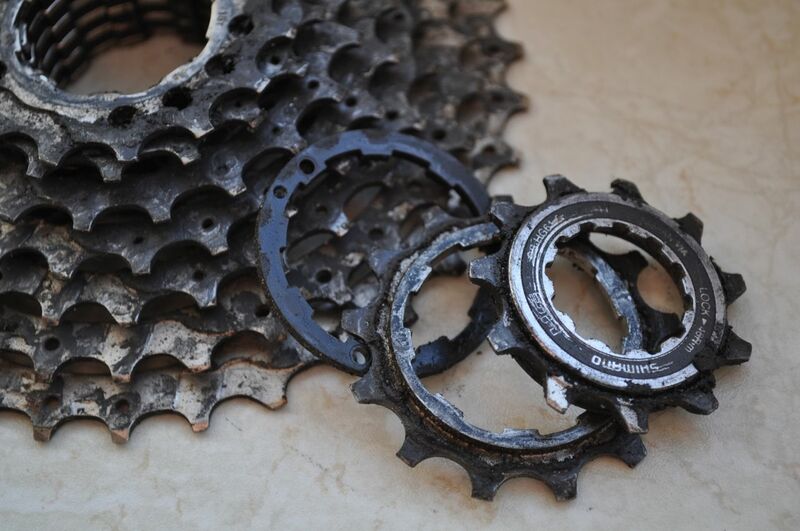 It used to be said that Campagnola equipment “wore in”, whilst Shimano “wore out”. 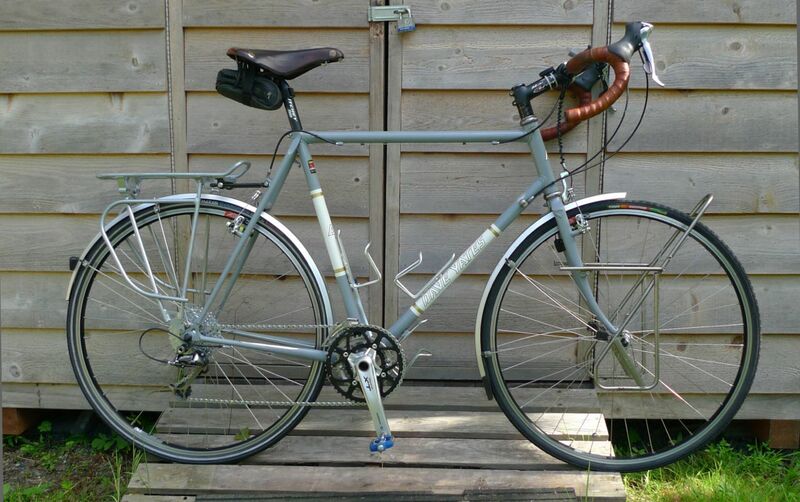 Our other bikes are from head to foot Campagnola and we have equipped touring bikes with these Italian jewel’s. The problem is warranty. Best of luck getting anywhere with Campag even if it is the Record Groupset and you have the receipts. The best for ‘life on the road’ is Shimano, as it is universal. The mountain bike stuff works with the road stuff, mostly. Esther’s Shimano XT cassett after 7,000 miles. So you follow the rule of diminishing returns applied thus. An item gets better as you go up the group sets in the following pattern. Better, better, better and lighter, better and lighter and then too light and too expensive. The first track on the second side of any album was always the best, and here, the second from top is the one to go for. This in the language of Shimano, is XT. Esther’s XT casset has lasted 7,000 miles and our chains 5,000. Crank Brothers Pedals. 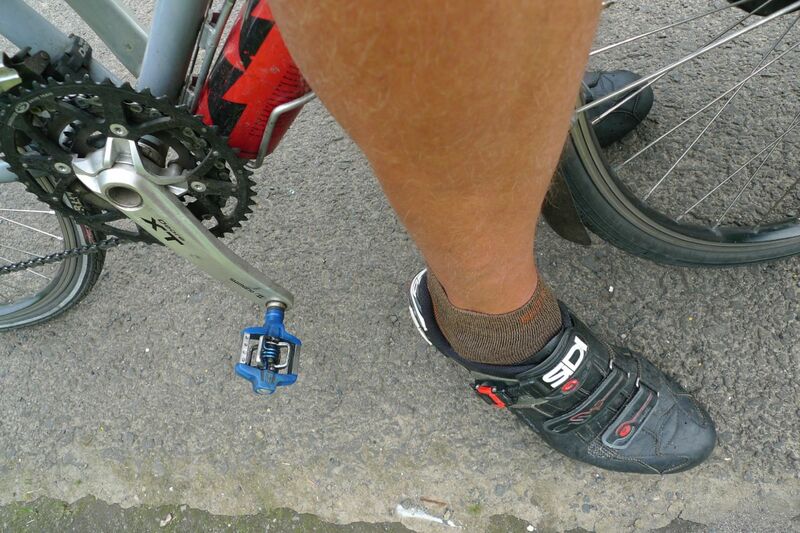 The only major thing on the bike where everyone else uses Shimano, whilst we do not, are the pedals. All our bikes have Crank Brothers pedals because we find them easy to use and very comfortable. In 2011 they actually started to make a set that did not wear out after 2,000 miles. They still do not do the “I bought these in 91 and they have been on every bike since”, trick that Shimano does, but boy are they comfortable. They are now good for 5,000 miles and more if you weigh as little as Esther. Crank Brothers pedals – get the 2011 not these 2110 ones. Tubus Racks. This is an area of the bike that separates us from mere cyclists and allows us a step closer to immortality. Hanging some bags off a bike both front and back turns a humble means of transport into a way to see the world. We have made mistakes in this area in years gone by. We have bought cheap and have paid more than twice. There is only one brand of rack that is approved for the use of a child seat on a bike, and that is Tubus. We learned that about 10 years ago and have bought nothing but Tubus since. We suggest that you do the same. Chris King Headset. Everything on your bike that rotates, will have bearings helping it do just that. Your wheels, the cranks of your pedals and up front, the handlebars. The fact that you have chosen to put quite a bit of your worldly possessions in the two bags that are hanging off your front forks, makes a big difference on the loading of this bearing. Every time you hit a bump or pull hard on the breaks, the front wheel will try to join the back wheel. It is this side loading that bearing systems hate. The price is excessive, but this is a fit and forget solution. Esther’s bike has a 1″ headset, which is not as easy to find as you may think. Fit one of these if you can and marvel at the quality of engineering. It will also show to fellow travellers that you are a descent sort of chap and possibly quite knowledgable. 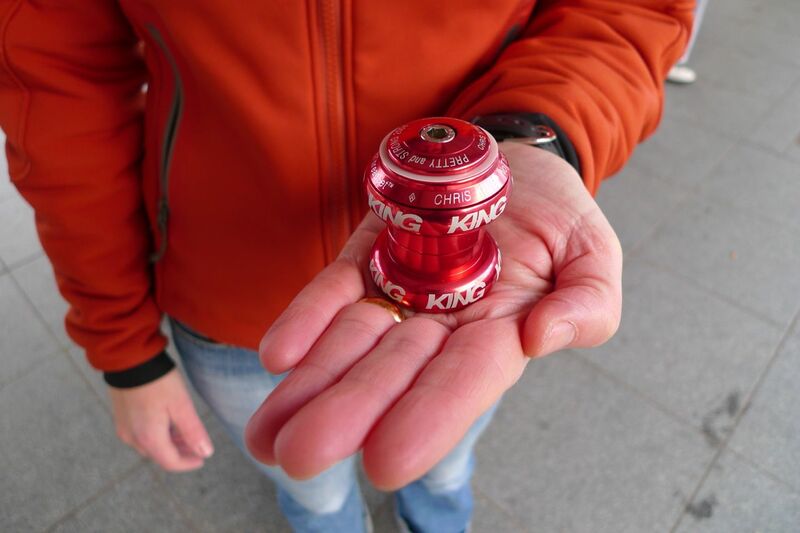 A Chris King Headset – worth every penny. 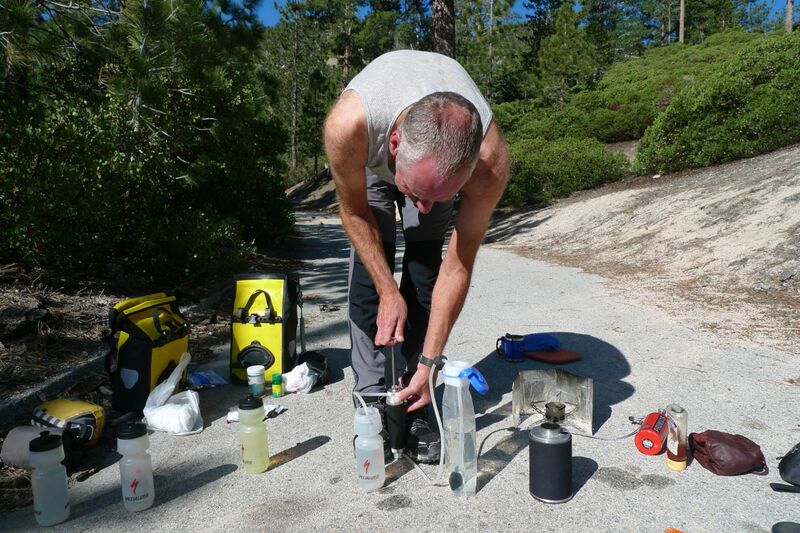 Katadyn Pocket Water Filter or SteriPen system. We used the Katadyn in the USA and New Zealand and loved it’s Swiss build quality and great output. I have said before that this would only fit in a pocket if the pocket had been made specially for it. It is neither light nor small and I have eyed it with hatred. Rather like Dylan, we have now gone electic. The SteriPen is now in the bottom of the pannier. We will let you know how it goes. Working with the Katadyn filter – great bit of kit, but heavy! Pot Cosy. This is our top bit of equipment. We no longer know how to cook without using it and it may be possible to save the planet with its widespread use. Go and find how to make one on the WWW. I have made a double skin one for the second year – it can only be better. A happy hour. 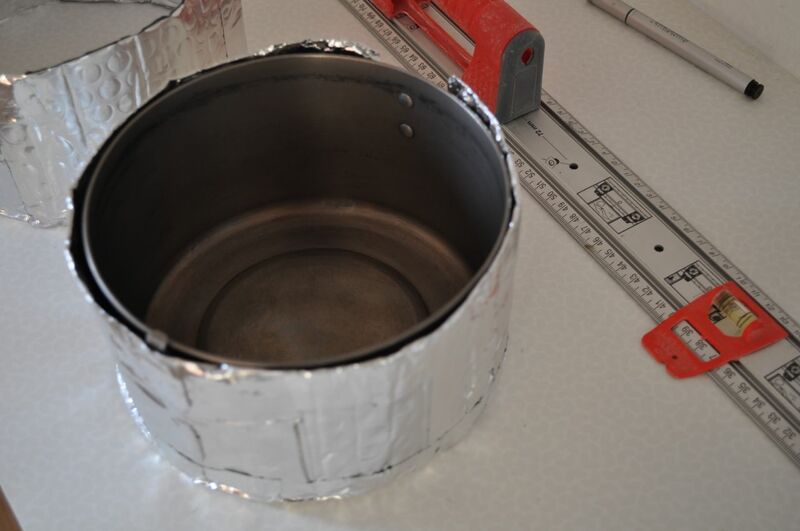 Making a Pot Cosy. 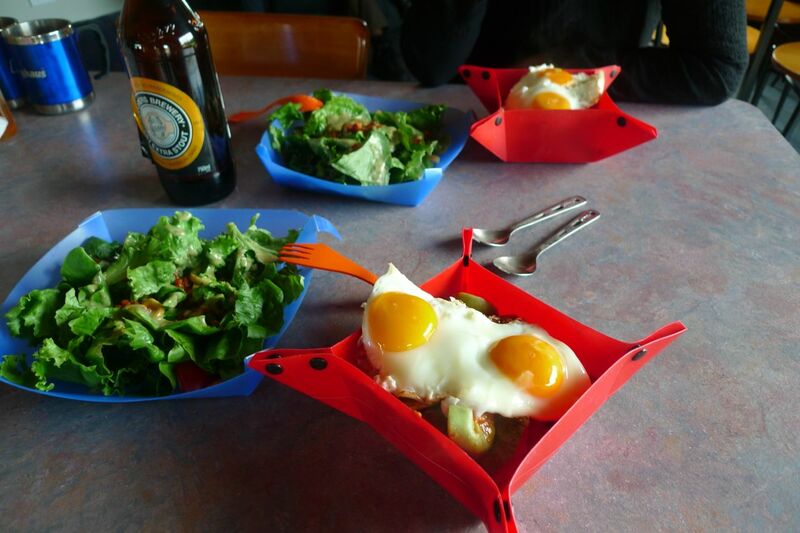 Lightweight Plates. The red ones here are the original and best. They use a button, poper system that is simplicity itself. They are not sold anymore. The blue ones with tabs are not even worth excepting as a gift. The orange style are available from REI and perhaps else where and are just about useable if you are not too hungry. Filling them twice would work, but who would have that much patience. 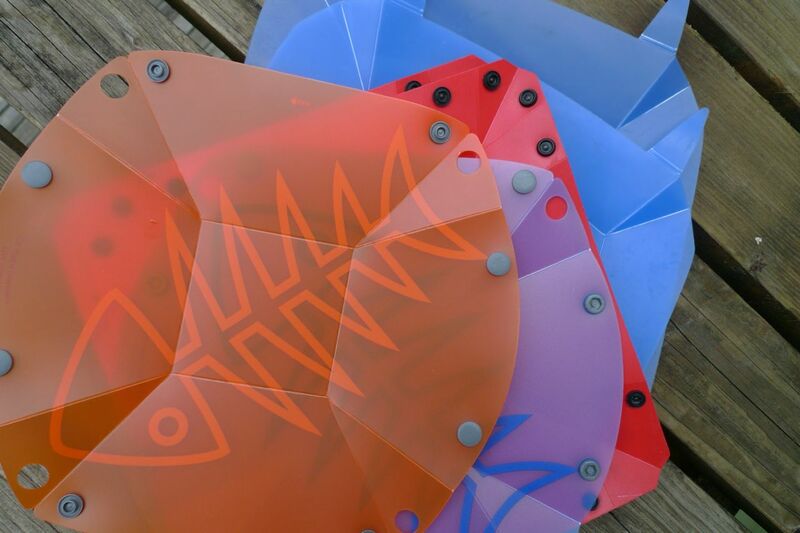 Lightweight plates from our collection. Get these if you can. The Garmin GPS and RAM bike mount. “Where are we?”, is an area of ‘life on the road’, that can lead to couples breaking up after 20 years of marriage and a party of 10 becoming a part of 2. It is simply put, the most important topic of the day, just ahead of “what are we going to eat?”. Your map should be up there in front of you and not in your back pocket or bag, or you will 100% guaranteed, get lost. In Europe, as we rode through Holland, we decided that we had seen more road junctions in 300K than in the whole of California. The bewildering choice is what makes Europe so good for touring, but it is also an area that can make a good day turn bad. 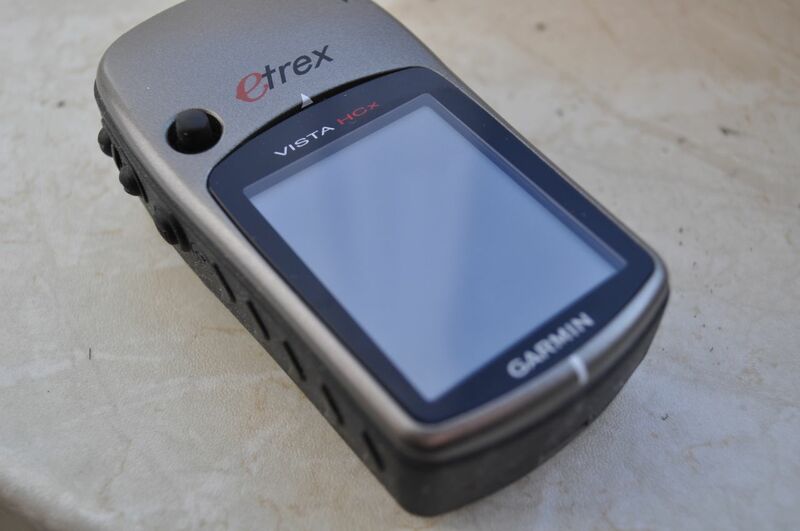 We have gone for the Garmin Etrex Vista HCX on account of the storage capacity. We would also pick it first because of almost twice ( 25 hours in this case ), the battery life of the similar units. It has been used for perhaps 500k and worked perfectly. 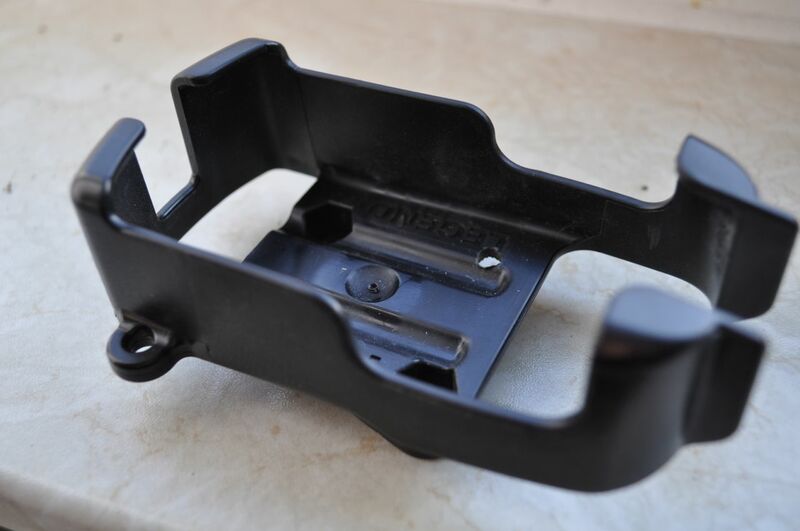 RAM bike mount for Garmin GPS. Like the map, it is no use having this in your bag. You want it on the bars, which is a bit of a problem. None of the reviews that I came across had anything but scorn for Garmin’s holding system. A bit of work on the WWW. and I came across RAM GPS holders, which get great reviews. I then came across a website that showed how to do a very nice bodge to get the unit to fit on the handlebar stem. It looks good. RAM mount – customised by me. mKettle. Boiling water without using the fuel that you have hauled up the mountain has to be a good idea. Using this and your wonderful pot cosy you get half your meal cooked without any fuel use at all. If you use boil in the bag meals, then you are A) A millionaire and B) Not going to need anything else. We found out why the USA has so many forest fires. It is quite simply that everything burns so easily, simple as that. Lighting a fire can also keep bugs away and help with moral. mKettle makes a campsite complete. BIG AGNES tents. 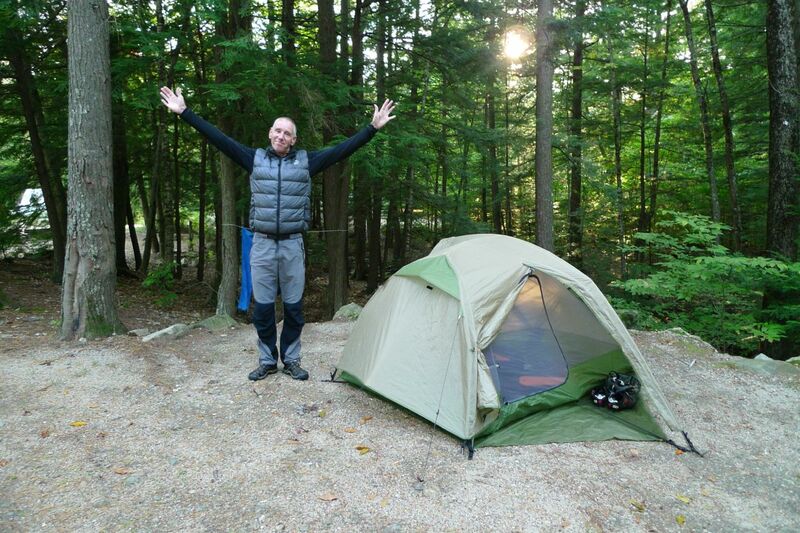 Second to the bike and perhaps not that far behind in importance, is the choice of tent. The quality and reliability of your new home ‘on the road’ is what will keep you awake at night. Weight for weight and performance for performance, we can find nothing too much better than Big Agnes. Lots of room, even at the ends and two vestibules make this a very usable tent. We have had great service from the company, which is always important. We changed the pegs to a ‘V’ shape Ti for stability and also have a few ‘nail style’ Ti pegs in case we end up on a RV site hard standing or similar, and need to get a peg in to tough ground. Big Agnes Emerald Mountain – no longer available. Ortlieb and Vaude Panniers. Well goodness what a decision. Not since having to face a rapidly depressurizing aircraft, and wondering “Which one of the twins shall I place the oxygen mask on first?”, has there been a more difficult choice. The WWW. is full of debate, with most favouring Ortlieb. Esther uses the BIG ‘O’ and I have used Vaude for almost 15 years and still use the same bags. If you set out to break them you will probably manage, but you would have to fit them really badly. Neither are immune from the attention of Raccoons. I would toss a coin, as there are virtues in both. G’day, Great run down on your gear! Do you mind if I ask how you transport your gear in between trips? I generally use a bike box and try to strap the panniers together as much as possible but it never seems ideal.Thanks. Well what we do is use a padded bike bag – you buy them off Ebay for not much money. 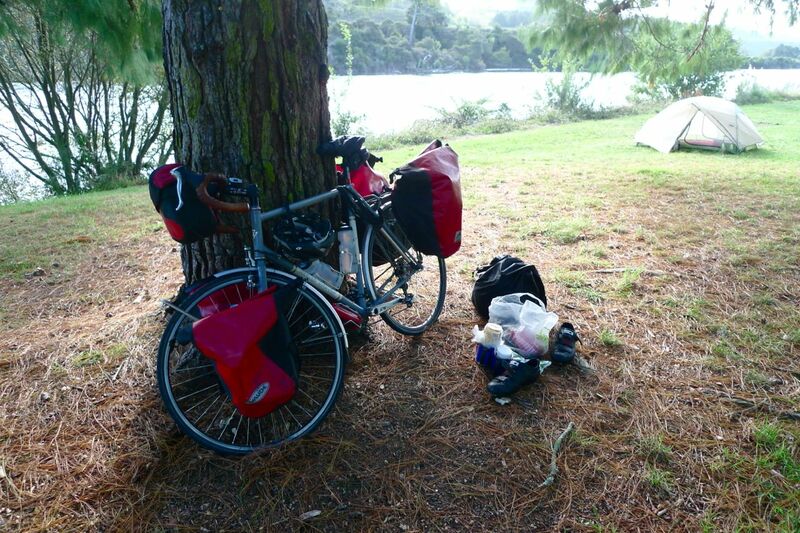 If it is a circular trip ( NZ ), they get stored at the first night accomadation. If it is a long ‘line’ tour they get mailed to the end. The panniers are gaffer taped together and then put in a big stuff-sac. Most things are zip tied to stop movement in the bags – plus a lot of plumer insulation that is zip tied to protect the frames – which is chucked in the bin on arrival. Try to make sure that the weight is under flight weight and only counts as two bags. There are other ways – check out mikesimagination from our site – he does it very well and in a rougher way – but he is a top engineer. Hope that helps. Hi Just wondering what your experience of Brookes saddles has been. I have struggled to get a lay back post with sufficient movement and Brooks don’t sell one which is a bit short sighted. How did you get on ? Any tips on lay back post? Gordon – My wife is on a Brookes from the 50’s – the leather is far better. I have the identical one and needed replacing last year after just 10,000Km ( I am told that I over lubed it ). There is a French leather saddle that Spa Cycles sell – I think it may be better but it costs. If you weigh less than 90Kg things are easier on the saddle – it may be that at 98Kg I am too heavy for the Brookes. You can over tighten a Brookes – which you only realise when you have got it wrong. Thomson do a Layback post I think. B17 has a heavy leather option – which I would go for and they have a narrow option which would be my choice. With drop bars a wide saddle does not work with your pelvis angle. As you can see – there are lots of places to get it wrong. Let me know if that helps. Brooks – well the one I am using – a Pro. The first one lasted less than 10,000Km and went back to Brooks. I may have put too much saddle cream on it. This new one has done 20,000Km and has been treated with less respect – look happy enough, but I would say it has less tan 10,000Km left in it. Esther has one from 1950 something. You can feel tat the leather is thicker – it requires so little TLC and works just fine. I would say this will outlive us all. PIck up an old one if you can is the motto. 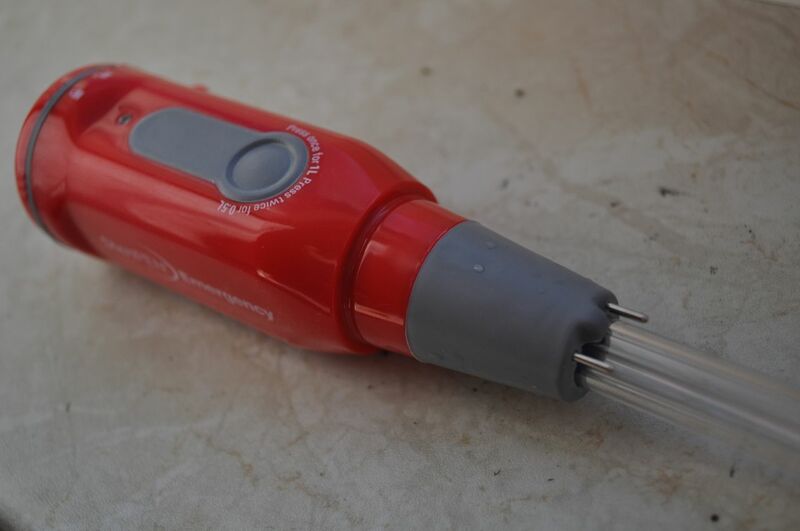 Mr Walker – just found that my Brooks Pro, with just 30,000Km on the clock is broken. The U shaped thing that the rivets are riveted to and the rails connected to is broken. The Brooks bar tape has lasted longer. Not happy – it has rusted through! Mr Walker I think that Spa Cycles stopped stoking Brooks because of quality issues. They stock a French made saddle – I had one in my hand and was very impressed with it – also loved the tension system. I think I would go for one of those – the leather was far better than Brooks. The Pro that Esther uses was 50 years old before she got it – it took no breaking in and worked for her from day one. I have just put a B17 narrow on so we will see what happens with that. I’m aware of the Spa Cycles alternative and might give one a spin. Do try to support British jobs if possible but if the quality is a concern, then perhaps it is time to look elsewhere. Walker – I think Brooks is actually part of Selle – which is Italian, if that makes it any easier. British jobs though and just down the road from where I was born. Yep… hence my point about British jobs, if not a British company any more. Mr Walker – Just to update. I have had to change from my Brooks Pro to a B17 narrow ( the pro rail broke!!! ). I must say that the B17 feels a lot better made – thicker leather and a robust feel. The good thing is that the narrow B17 feels the same to ride on as the Pro and almost looks as nice. This may be the answer – what are your thoughts? Hmmm… Interesting. Might give one of these a try. My own experiences show that the standard b17 is wearing better than my two pros. Probably no reason for this in terms of product specifications, but that’s the result. All have had the same care routine. I have destroyed two Pro models – 10,000Km max each. The B17 narrow appears to be a stronger design – smaller rivet area and so on. The leather feels thicker ( not sure if you can specify the endurance leather that they offer for the B17 ). I think it will last much longer and with the narrow shape, it suits drop handelbar riding position. I will let you know. Hi Warren, Thanks for the response yes I have a trio of Brooks saddles a couple of Professionals and one Champion Narrow B17 which I picked up from their factory last year. I understood from Tony Colegrove in Rye that the older oval logo saddles were made with better leather hence they hold their value well. My problem with the Professional that I had worn in was that I was sitting on the frame and not the suspended leather part of the saddle. I haven’t tried a Thomson Layback post yet – too expensive for a mistake – but you seem to have one on the Dave Yates cycle and if so I was wondering if this had been successful? Getting the contact points right is never ending but I would imagine that after the mileage that you have both done it must be as close to the perfect compromise as you can get it. Thanks again for the response. Gordon – My saddle of choice on my road bikes is the Fizik Arione – the Brooks Pro has the same feel – which is why I went for it – plus by pal Brian at THEWASHINGMACHINEPOST thought I would like it. If you are on the frame, it needs to be moved back. The Yates uses a 1″ so the pins are not easy to find. The shorts are always part of the comfort of a saddle – I now use Rapha – which are the best and hardest wearing on the planet – worth every penny. I haven’t tried a Fizik Arione but given the recommendation will seriously look into these. My seat post is a 26.8 mm for a Bryan Rourke frame which limits the available layback but that’s what ebay is for I suppose. I have used the Altura Progel Shorts which are an improvement over the Decathlon starter range but will seek out the Rapha next time I am buying. Thanks very much for the advice it is much appreciated. I enjoy the blog and envy your opportunity to travel to see such fabulous scenery and meet so many interesting people. Keep peddling ! Todd – The Brookes works – make sure you get the right one for the style of bars – a B17 does not work for me but the Pro does. Also the shorts are very important – but less so with the B17 – not easy. Best of luck.